On Saturday 16 June, the 2018 season of Art & Design Saturday at Keyes Art Mile is further bolstering its position as an essential part of Joburg’s creative calendar with the announcement that The Emporium will become a regular feature of the event’s offering. 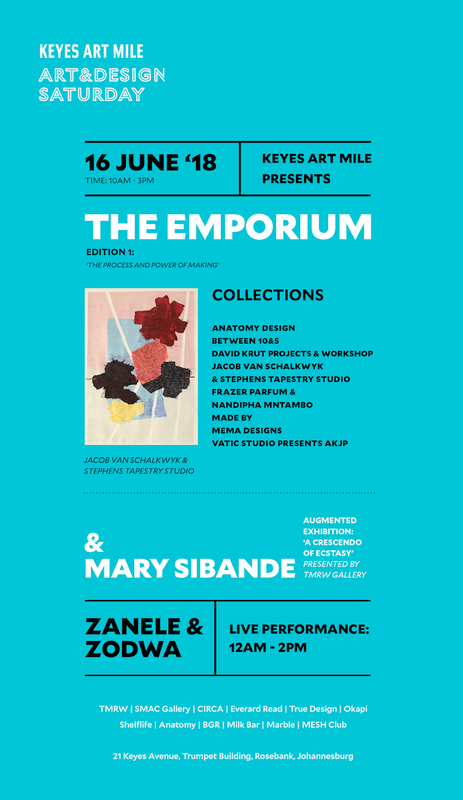 Taking its inspiration from the contemporary art stores of the world’s leading galleries and museums, The Emporium will be a monthly bespoke, luxury event featuring the work of carefully selected art and design creatives. Echoing the ethos of the current Art & Design Saturday season, this highly curated environment will be a space for art lovers, creative aficionados, newcomers to the design scene and those seeking a one-of-a-kind retail experience. The Emporium at Art & Design Saturday will see visitors browsing through exquisitely crafted objects and offerings – from an artist-inspired scent to a large-scale, mohair tapestry or a limited edition chandelier. These experiences will be showcased within the broader Art & Design Saturday context which features an unmissable mix of visual art activations, the chance to meet contemporary artists and designers, the viewing of short films in a private cinema, visiting galleries in the precinct and taking advantage of Keyes Art Miles’ retail outlets and eateries - including BGR, MESH Club, Milk Bar, Marble, SMAC, TMRW, True Design Okapi, Shelflife and Anatomy. A programme (see below) of talks and demonstrations by the participating exhibitors will be held throughout the day in the Atrium and MESH Cinema. Art enthusiasts will also have special access to the tech wizards behind Mary Sibande’s new interactive and VR installation, A Crescendo of Ecstasy produced in collaboration with TMRW Gallery. And last but not least, a mix of disco, hip-hop, vintage and electro R&B, vocal house and jazz will play throughout the day courtesy of DJ, sister duo Zanele and Zodwa. 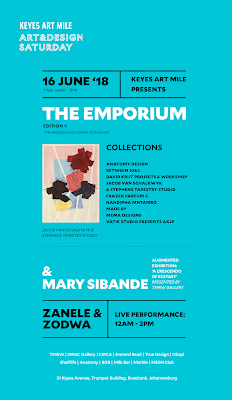 Visitors are encouraged to diarise the second edition of the Emporium to take place on July 14th with a new selection of Emporium artists and designers alongside a “Focus on Photography” celebrating iconic South African images from the archives of the Market Photo Workshop and the Alf Kumalo Estate. At Everard Read Gallery one can expect to catch the last day of the exhibition “Botanical Art Worldwide: Linking People With Plants Through Contemporary Botanical Art” - an international exhibition initiated by the American Society of Botanical Artists in which 25 different botanical art societies have participated. The 25 participating countries/regions, representing 6 continents, include Australia, Bermuda, Brazil, Canada, Chile, China, Colombia, Costa Rica, France, Germany, Indonesia, Ireland, Italy, Japan, Mexico, Netherlands, New Zealand, Russia, Scotland, South Africa, South Korea, Thailand, Ukraine, the United Kingdom, and the United States. At CIRCA Gallery “Forests of the Night” is curated in response to “Botanical Art Worldwide: Linking People With Plants Through Contemporary Botanical Art”. 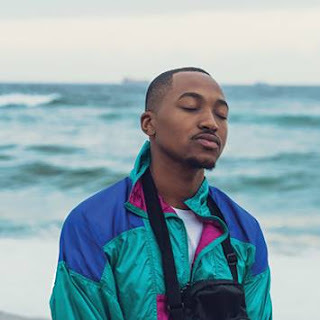 The exhibition showcases the work of a selection of South African artists, who incorporate botanical elements in their work as they engage in wider conversations in contemporary art. TMRW digital gallery will be exhibiting Mary Sibande’s long-awaited new interactive and VR installation, “A Crescendo of Ecstasy”. Anatomy, True Design, Okapi and Shelflife will all be open for browsing. Lighting designers Sian Eliot and Ari Geva discuss their unique process behind creating handmade lighting installations and chandeliers woven from aluminium fabrics. Their exquisite pieces are finely crafted and have been described as ‘jewellery for architectural spaces’. Artist, Nandipha Mntambo explores the multi-layered approach of creating her new scent, Dissonance, in close collaboration with master perfumer Tammy Frazer. The limited edition includes a hand-blown glass bottle by David Reade, perfume by Tammy Frazer and two unique gold leafed lithographs by Mntambo. Artist, Jacob van Schalkwyk in conversation with Marguerite Stephens of Stephens Tapestry Studio around their creation of Constraint - a new, large-scale, mohair tapestry woven on a vertical loom using mohair spun in Swaziland. The Studio is known for translating the original concepts of William Kentridge into intricate tapestries. David Krut Projects and Workshop will host a series of demonstrations on a small press to show the complex process behind woodcut printing and the creation of large-scale works. Directed by Master Printmaker, Jillian Ross, the studio specialises in printing processes such as etching, monotype and relief printing. Made By will have on display their jewellery workshop experience, where the art of lost wax carving is taught by hosts Henriette Botha and Nikki Sherman. These workshops allow participants to design their own pieces that are 100% unique within an inclusive and creatively free environment. DJ, sister duo Zanele and Zodwa will entertain audiences with their eclectic mix of disco, hip-hop, vintage and electro R&B, vocal house and jazz. Coffee at Yield or MESH Club along with breakfast, lunch and tapas for sundowners with a selection of bespoke cocktails from their new bar MIX. Lunch at Marble, taking in the breathtaking panorama over Joburg, or head to BGR and Milk Bar for their casual delicious fare. And for some retail therapy head over to Anatomy, True Design, Okapi and Shelflife all open from 10:00 - 17:00. The inclusion of bespoke Emporiums as part of Art & Design Saturdays adds to the already popular combination that has drawn visitors to Keyes Art Mile over three different Saturdays in March, April and May. Each of these have traversed a different creative field – from May’s furniture focus in the exhibition, Masters of Modernism: Exploring Craftsmanship in Design, to the spotlight on new technologies in April’s Art X Tech focus and the latest in local menswear design in March. The 2018 season of Art & Design Saturday at Keyes Art Mile brings together new and established creative voices, providing a space for both critical engagement and laid-back entertainment.